Media: If it is illegal for the Trust to accept contributions for the construction of Maha Samadhi which is purported to be a religious activity, would it not be financial impropriety for the construction company building the Samadhi to accept cash payments for this purpose? S.S.N. : The few dollars found have been deposited in the bank. There is no question of anything else being there other than what is deposited in the bank. Coming now to the financial impropriety you are talking about, the payment of money to a contractor in cash is not illegal. I do not know of any law which states you cannot make such a payment. When I constructed my house, I had to make some of the payments in cash because the contractor said when he goes to the market some of the sellers insist on cash payment. So even though every rupee of mine is accounted for, the other person does not want it that way but he gives me a bill. There is no law which says that there can really be no cash payment at all. The second aspect here – as Mr. Srinivasan already explained – is that the construction of the Maha Samadhi is really not an activity of the Trust but of a group of devotees who have come forward to endow this Samadhi to the Trust. And this is nothing new; it has happened in many cases. Many of the buildings here have been endowed to the Trust in this manner. For instance, even this building (the Indoor Stadium) came up when a donor came forward to bear the entire cost of this construction. So he gave the funds to the Trust to be used for this purpose. There are other cases when the donors have taken Bhagawan's permission to engage a contractor to construct the building on Trust's property and then offered the entire structure to Baba. This is accounted for in the books of the Trust as donation in kind. In either case, it is completely accounted for. Now in the case of the Maha Samadhi construction we have permitted another agency to do the structure in our premises because essentially it is a religious activity and as a public charitable trust we cannot commit our resources for it. Therefore this methodology is well-tested and very much within the four corners of law; there is absolutely no problem. S.S.N. : To the best of our knowledge there is no will made by Bhagawan Baba. A will is a formal document which has to be in writing, be witnessed and signed by the author; in this case Baba should have signed it. Till now such a document has not surfaced; we have not found anything in His personal quarters. I have been serving as the legal advisor of the Trust for several years and am aware of most of Trust's documents. If such a document existed generally I would know of it. Swami had never told me that He would like to make a will. Therefore to my personal knowledge there is no will, and physically we did not find one. Therefore I am certain it does not exist. The second aspect here is about His instructions. There are some people claiming that Baba had given them some directions which they will reveal at an appropriate stage to the devotees. All can I say about this is it would be very difficult for the Trustees to act legally on any oral instruction. Nevertheless, if the concerned devotee has some suggestions which are in good interest of the Trust or the ashram, the Trustees would definitely apply their minds and implement them. Media (to Mr. V.S. ): We learnt that Mr. Ratnakar was involved in coordinating the efforts to collect donations for the Samadhi construction which had to be passed on to the construction agency. Then, how did you get involved in this affair? V.S. : The fact is it is not true that Mr. Ratnakar was given the responsibility of collecting money for the constructing of the Samadhi. I only said that those devotees who had given money to Ratnakar wanted this to be handed over to the Project Manager of the construction agency. Mr. Ratnakar requested me to accompany him when he was handing over this amount. I had no idea who had given the money to him. Just because I was present at his request – I obliged because he is also a Trustee and like a younger brother – many stories were created stating that I was involved in the incident. My role in this whole issue was minimal; I only accompanied him. S.S.N. : Regarding your first question, there is no law which requires us to publish our accounts in newspapers. About five years ago there was a proposal to introduce an amendment to the Income Tax Act to make it compulsory for all the public charitable trusts to publish annual accounts in newspapers. When this was moved, there was a lot of debate and the Parliament finally did not approve the proposal; so the amendment never happened. To the best of my knowledge no public charitable trust is publishing its financial figures in any newspaper; atleast I have not seen any such report. You generally see advertisements of corporate bodies; they have to do it because as listed companies they are legally required to publish their financials every quarter. However, this is not the case with charitable trusts. We are in line with every other charitable trust, none of them are publishing their accounts and legally there really is no need for it. If your think that we should do it, I am afraid nobody has done it till now, so we have also not considered it thus far. Your second question was on inventorisation. Now in this situation where do you draw the line? Someone will say 'call the Media,' the other 'invite the family,' the third 'call the Government,' the fourth 'call a foreigner,' and so on. You should undertand that we are all responsible members of the Trust selected by Bhagawan Himself. We have no personal motives or agenda in any of these things; none of us had earlier entered Swami’s room. Mr. Srinivasan has been coming here for the past 40 or more years, even he has never seen Bhagawan’s room. Therefore we never knew that these things existed. When we came to know of it, we devised a procedure. We already have very eminent people as Trustees - one is a former Chief Justice of India, the other a very senior Chartered Accountant, the third a former Chief Vigilance Commissioner, Government of India, and so on. Mind you, none of them take even a rupee in any form. I can tell you with certainty that we are all spending from our pockets for rendering service. We travel in our own vehicles and never take a single paisa for anything. Therefore we have nothing personal in this Trust; we are giving our time and energy as our offering to Bhagawan. Actually today I was supposed to be in Goa for a case but when the Trustees asked me to stay back, I cancelled that trip because my first duty is to Bhagawan. Therefore you must understand why we are doing all this. Going back to Yajur Mandir inventorisation, the Trustees decided that it would be better to have some representatives either from the Government or elsewhere. So we had informal discussions with some Government officials and decided to invite two very senior individuals, one a former Justice of the Supreme Court and the other a former Judge of the Bombay and Karnataka High Court. Again, these are people who have no axe to grind. Even though they are in their late seventies, both of them were there till 12.30 in the night and left the premises only after the entire exercise was complete. Media: But both of them are Baba's devotees. S.S.N: No, Justice Vaidhyanatha has barely come to Puttaparthi in the past twenty years. I do not consider him a Baba devotee in that sense. Media: You said you had discussions with some Government officials regarding this. Who were they? S.S.N. : Yes, we did discuss with senior officers of the Government but we cannot disclose their names. V.S. : Actually, there is no requirement for us to divulge that information. In fact the Government officials told us to go about it ourselves. So the Trustees decided to have some independent people to oversee this exercise. I am sorry, I cannot name with whom we had informal discussions. I am telling you this looking into your eyes; it is not as if our actions are malafide! Whether you want to believe this or not is your choice. V.S. : Yajur Mandir was opened prior to all these allegations. Please be factually correct in your questions. S.S.N. : The names of the donors have been given to the court. The donors too have filed affidavits along with their PAN numbers and other details – all of this is there in court files. At this point I do not want to give their names and enter into a big debate about who they are, where they are from and so on. In any case, this is not something which the Trust is aware of or concerned with. The second question is about accounting. As I mentioned earlier once the Samadhi is complete and offered to the Trust it will be treated as donation in kind. Media: Is there some kind of a divide between the members of the Trust and the family? Other day a family member said that there was a threat to her life. Some other family members have also complained that when Baba was in the hospital the details about the condition of His health were not shared with them. They say they had no clue about the recent Rs. 35 lakh contribution too. Why is there no transparency between the Trust and the family? V.S. : Firstly please understand that we are Trustees of a public charitable trust. Officially we do not recognize any family member - let us be clear on this. The law governing Trusts has put down the duties of the Trustees. We cannot give a special recognition to any claim made by a family member. Nevertheless, we certainly keep the lines of communication open with them; we respect their views. However my categorical reply to this question is this: We are not required to give out any information specifically to family members which we are not sharing with other people. Please make note of this; I do not want to be ambiguous about it! Coming to the next question, what is the normal recourse for a person facing a life threat? He or she goes to the police station and lodges a complaint. One can follow this course of action. As far as I am concerned, I can categorically say that I have not threatened anyone's life. 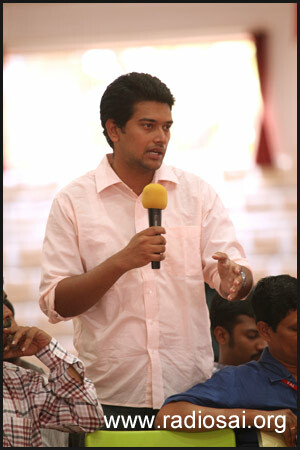 Finally there was a question about sharing information about Bhagawan's health. Please note that when Baba was in the hospital the family members were given all the privileges possible. The problem arose when everybody wanted to go to the ICU! Even we never went inside for many days because the doctors did not want any infection in the ICU. So it is not as if someone was granted exclusive permission which was denied to the family members. You say we have not maintained Baba's health file. How do you know? Have you read the newspaper a week ago? Now it is illegal to disclose the private health reports of any person. In fact some of the doctors who disclosed information about Bhagawan's health condition when He was in the hospital have committed a breach of law! We have to respect Bhagawan’s private rights. V.S. : Let me take your first question. Our immediate concern is to make sure that all the present activities continue and we do have resources to run everything. Baba had Divine vision to take up new projects. But we are human beings. So we will carefully deliberate on how we should utilise the funds of the Trust for public charitable works and then decide on new activities. In any case, you may be aware of the recently launched Sri Sathya Sai Vidya Vahini Project, which is a web-based learning system for rural schools. The Trust has already started spending money for this programme. Similarly we are looking at all the schools run by the Sai Organization throughout India; most of these are in rural areas and they do need additional infrastructure and facilities. We are now considering and evaluating these proposals. Baba had Divine insight to decide on these matters but now we have to follow a professional and pragmatic approach. With regards to what message we have for the residents of Puttaparthi, our only appeal to them is not to be carried away by all these reports and news items floated by the Media. Whether they believe the Trustees or not, they need to have faith in Bhagawan. They are what they are only because of Baba. They should not feel that Baba has disappeared. Bhagawan was there, is there, and will be there! Baba’s presence is felt by millions of people all over the world even now. Whatever He wants He will make it happen. If the Trustees have to be removed He will ensure that. Everything is in His hands; nothing is impossible for Him. Therefore my sincere appeal to the people and residents of Puttaparthi is to have faith in Bhagawan and be patient. All of this (the recent media concocted controversies) will also pass and we will do our best to discharge the responsibilities given to us by Bhagawan. S.S.N. : Mr. Srinivasan has already very clearly answered this question. From the time the Trustees have been in position, we have not received any cash donation. Regarding the source of money that was found in Bhagawan’s chambers, we have no idea; the current Trustees were appointed just a few months ago. Therefore this is a wild allegation. Bhagawan in His Divine wisdom had received the money we found in Yajur Mandir and it is now being utilised for public good. The moment we came to know of this amount we deposited it in our banks; it is not black money as we have paid tax on it. S.S.N. : Looking at various beneficial activities being undertaken by the Trust, if the Government has awarded us some concessions it is only to appreciate the work that is being done. Media: According to Government Order 428 you have an exemption not to allow inspection by the police. How many exemptions have you received? What are they and since when are they applicable? S.S.N. : There are any number of public charitable trusts in India. Depending on the facts and circumstances of each case the Government exercises its power. It is not a quid pro quo; it is not as if the Government says that today I am giving you this exemption tomorrow you give admission to my student in your college, or that today I am giving you this tax exemption, you make sure that the patient I send gets treated in your hospital. When Bhagawan was there, no such conditional donations or exemptions were solicited or accepted. Regarding allowing inspections by the police, the administration of the ashram is under the control of the Secretary. 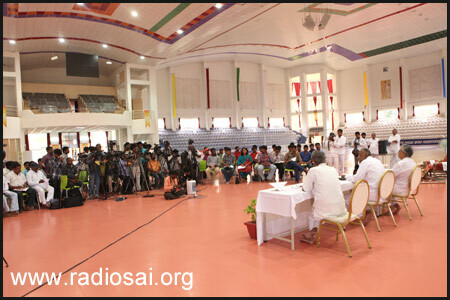 When Bhagawan was there he took His instructions to make arrangements for anyone coming to Prasanthi Nilayam. I remember whenever senior policemen came to the Ashram, they were treated with great respect. For example whenever the Collector or the Superintendent of Police were here they were well received and were given place in the front row when Bhagawan came for darshan. Baba also used to talk to them and bless them; I have personally seen this any number of times. In fact every time there was a change of shift of the five or six constables who used to be Swami’s personal security guards, Baba used to call and speak to them, bless their families and also give them gifts. Therefore, if anyone feels they were not given respect, it is not correct. V.S. : Firstly, the other day Mr. Ratan Tata was here only as a devotee to pay his obeisance to Bhagawan's Samadhi. He has no connection with the Trust. Rumours of him becoming a member of the Trust are absolutely incorrect. He returned the same day after having Bhagawan's Samadhi darshan. He did not go to Yajur Mandir. 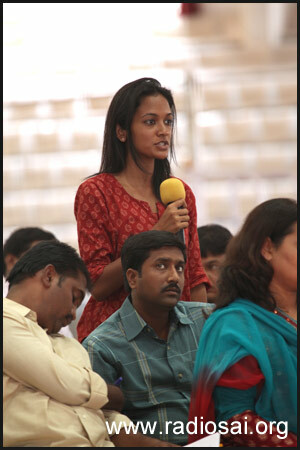 Coming to your second question, I am as close to Mr. Chidambaram as you are! I have no special relationship with him. 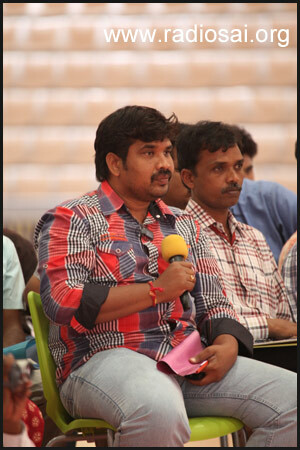 If I happen to see him whenever he comes to Chennai I do greet him and he too responds accordingly. In any case, what is the need for me to go to him? It is not as if we have done anything wrong or are stuck in a great problem. Nevertheless, I cannot say I do not know him or he does not know me as I have been the President of CII (Confederaton of Indian Industries). But there is nothing more to it. V.S. : We understand the concerns of the Media. That is why we are now setting up a Public Information Centre to which all of you will have access. From now on we will have a very structured relationship with the Media and Prof. Anantharaman will head this centre. Please give him a little time to set up his office, establish contacts with you all, and so on. Then you can have a one-to-one contact with him. V.S. : Satyajit is not under a gag order or anything like that. He is a free individual. Of course, being a former student he is a bit apprehensive to straightaway face the Media. But he has nothing to hide and it is not as if we have told him to keep away from the Media or otherwise. He is intelligent and quite transparent. He is not a member of the Trust but is spearheading one of our recent activities; he is now concentrating completely in the Vidya Vahini Program. We have given him leadership role in this project and he is now taking this mission forward. S.S.N. : In Andhra Pradesh there is a single act for both Religious and Charitable Endowments. Our Trust is also registered under that law. I do not know which petition you are referring to; in any case what probably would have happened is they would stated that we are registered under the Charitable and Religious Organisations Act. It is very clear from our Trust Deed that we are a public charitable trust registered in Hyderabad under the Andhra Religious Endowments Act. If you want more clarifications about what happened in 1993, I need to see that petition. Media: Why were relatives not present in Yajur Mandir when the inventory was being taken? V.S. : Mr. Ratnakar is a relative, he is also a Trustee. S.S.N. : Besides there are 250 relatives. Whom should we call and actually why should we? It is a matter involving the Trust. So we took the suggestion of some senior officials from the Government and devised our own procedure to go about it. V.S. 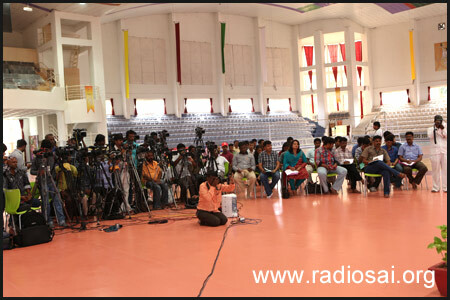 : We have many exhibition areas like the Chaitanya Jyothi Museum, the University Display Hall and so on. So we will decide on the right place to place these Memorabilia. It is just two months since Baba left us and we are now just settling down. In fact in Shirdi, Baba's personal items like His umbrella, grinding stone, etc. were displayed after several years. But we want to do this as early as possible. Media: Where is the Golden Chariot now? V.S. : It is very much there in Sai Kulwant Hall. We will take a suitable decision regarding its display too. V.S. : I have already talked about it in the opening statement. The fact that all the institutions are running in the normal fashion is itself the indication that we are working as we believe we should. Just because some allegations were made it does not mean we have done anything wrong. As I told you before it is very easy to resign and quit; it is actually very simple. But then who will take up this job? Mind you, this is a very complex institution. I have been with Baba for 40 years and have served Him in different capacities. 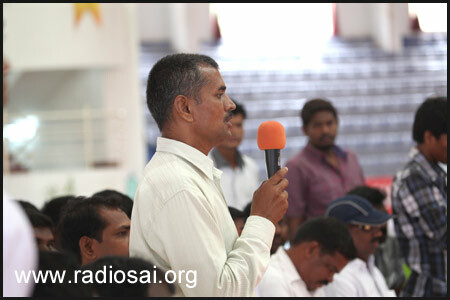 On one side the All India Sai Organization has 6 lakh volunteers and 30,000 centers. In fact I am now going to Jharkhand to attend a youth conference. I am continuously traveling all over India. Actually a few years ago I prayed to Bhagawan to appoint a younger person to take over as the All India President of Sai Organisation. Swami in His wisdom asked me to continue for some more time. It is He who is giving me the energy to work. Nevertheless I am also a human being and definitely we will be having younger people coming not only into the Trust but also into the Organisation. We are true to Bhagawan and we feel it is our duty to serve. Why should I tolerate all these allegations? In 50 years of my professional life I never had a single allegation. Actually these allegations have pained me a lot. That is why I prayed to Bhagawan. And the answer I received was I cannot run away just because there is a threat. I will remain a devotee till my last breath, whether I am an office bearer or not is not important. All of you are working from market information which people give you. 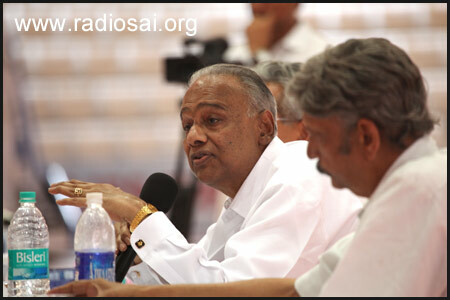 We have said on record that there are vested interests trying to discredit Swami’s institutions. Therefore kindly introspect. 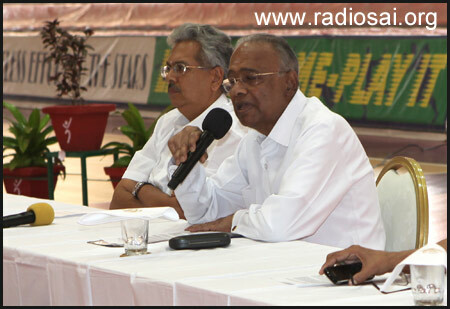 Today, you know me or Mr. Srinivasan only because of our association with Swami's institution. Tomorrow we may not be here but His institutions will go on; we need to protect these institutions. Please know that none of us have any personal agenda. If you discover that you have written something wrong, please retract your statement. Other day someone sent me a sms saying Mr. Srinivasan is arrested. So I immediately called him and he said, “I am in my home.” Then we informed the Press about this incorrect report but not one Media house published it. There were wrong reports of cash seizure worth 5-10 crores. We told you the information is absolutely false but again not one paper published this. You have a responsibility to God. Therefore for heavens sake, please introspect. Let us not bring Swami’s institutions down. It is important that we all work for His institutions because we are all part of society. If we bring an institution like the hospital down, who is going to serve there? V.S. : May I now thank you all. We have spent more than two hours and fifteen minutes together. In any case, as I mentioned earlier from now on we will have a system for regular interactions with the Media. Jai Sai Ram.